I recently met Mark Baker at the 2012 AAW Symposium in San Jose, California where he saw my work in the Instant Gallery. Mark, the Group Editor for the woodworking magazines published by the Guild of Master Craftsman Publications in East Sussex, England asked if I would be interested in having some photos of my work featured in an issue of “Woodturning” magazine. I was thrilled and agreed right away. In following up, Tegan Foley of “Woodturning” asked if I would answer some questions for a feature called “Twenty Minutes with Roman Stankus”. In the process of responding, I realized the content would make a nice bio for my website. Tell us about your background. When I was young, I liked making things and working on creative projects. I loved building wooden models in particular – both ships and planes. I loved spending time outdoors, exploring the local creeks, fossil hunting, fishing, and gardening under the eye of my mother. I was first introduced to woodturning in junior high school where I turned a small stack laminated walnut bowl with thick walls and a green felt bottom! I did some woodwork in architecture school – small things like speaker cabinets and architectural models. When I got out of college and needed some bookcases, I built them myself. I am a self-taught woodworker and a registered architect by profession. Design drives my work and woodworking gives me a lot of joy. How did you get into woodturning? In 2000 I bought my first lathe (a retired high school Delta VS 1236) as a means to produce woodworking tools and parts. 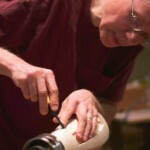 Two years ago when I decided to focus on woodturning in a more intense and creative way, my very good friend and accomplished turner, Mark Sillay ( www.marksillay.com ) helped me acquire many important technical skills of the craft. That platform of support and knowledge made it possible for me to pursue new directions in my work. Describe the type of work you produce. My work at this point is experimental and exploratory. I am currently producing non-functional pieces that investigate sculptural form, color, texture, and artistic composition. The basic forms of my pieces are created on the lathe and completed using a variety of methods including, routing, carving, burning, texturing and coloring. I am also using eccentric/multi axis turning methods and have developed and adapted a number of tools and techniques to achieve specific forms/geometries that interest me. I also produce some traditionally turned pieces. What inspires you? My education and training as an architect has influenced my work a great deal. Basic design skills are applicable to any creative effort. I love to work with geometry, textures, skin treatments, color, and sculptural concepts. I believe the most important part of what we do as creators of physical artifacts is in the design process. Interesting ideas, refined design, and controlled execution are goals in my work. How has your work changed since you started turning? The first year I turned, I focused on the fundamentals of traditional turning while trying to absorb and learn as much as I could about the many directions that turning has gone. Within a year, I began to explore ways to produce some of the concepts that I had considered but didn’t know how to execute. As I researched others work and became more familiar with the tools and processes to create them, I gained insights into methods that I am currently exploring. I still consider myself to be in a learning/exploring mode more than a production mode. My current work is contemporary and artistic in style. Who or what has been your greatest influence? 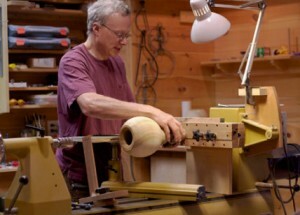 When I saw a demonstration by Cliff Lounsbury ( www.riverturnings.com ) using the router on a lathe, I realized that some of his methods would be invaluable to the kinds of pieces I was interested in producing. 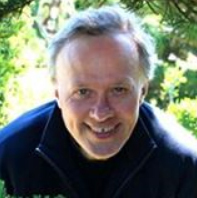 Cliff does entirely different types of work with his routing processes – I love that the same tools can be used to create such different forms. I owe a great deal to the many turners whose work I admire and have shared so much. Stylistically, I draw from many sources both manmade and natural and I enjoy studying artifacts from other cultures and time periods as ‘design wells” to draw from when appropriate. I have a library of design books that I refer to often. Tell us about your workshop. My workshop is a stand alone building I constructed in my back yard on the foundation of an old garage – approximately 18 x 32 feet with a storage loft. I have a power tool room with a complete set of compact power tools for doing traditional “flat” woodwork along with a Powermatic and a Conover lathe. I also have a separate smaller room with a workbench and many hand tools where I do “off the lathe” processes. I like to listen to music while I work. The shop is insulated well so it is quiet if I need it to be and it is a great place to focus on my work. Where do you see your self heading? I’d like to continue working on my sculptural pieces and hope that I can gain recognition in the woodturning/wood art community. Ultimately I’d like to make pieces that are larger in scale – pieces that might be appropriate as public art in larger settings. What is the best thing about turning? Everything except sanding! In particular, great people who share, extraordinary creative freedom and variety of expression, making big curls with a sharp tool, making beautiful shapes……where do you stop? I love the ability to interact with and design the piece in real time as much as the ability to design certain aspects of the piece prior to beginning turning. Turning is a very open and flexible process of design and creation. What are your aims and aspirations for the future? As I build a larger body of work, I want to make my work known in more places – particularly in the area of wood art.